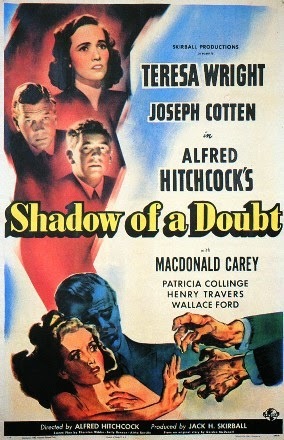 Alfred Hitchcock's Shadow of a Doubt (1943) is regarded as a marvelous film to this day. Following the Newton Family, the film presents the “average American Family” turned upside down with the arrival of Uncle Charlie (Joseph Cotton, Citizen Kane). The subject matter alone influenced countless films that followed, especially David Lynch’s Blue Velvet which is so thematically close, that it almost seems in vein of The Searches/Taxi Driver or Yojimbo/A Fistful of Dollars. The cast of SOAD is simply wonderful. Every single character is truly unique, and 3-dimensional. While certain traits of early film are seen (that is to say the trend toward a more theatrical performances) the performances were fantastic, with every character nailing her part. Truly an ensemble film, every character shines and adds to the tremendous achievement of the film. Standouts for me were the Newton’s patriarch Joe (Henry Traver, best known as “Clarence” from It’s a Wonderful Life) and his friend Herb (Hume Cronyn), who constantly meet to discuss murder novels and the best ways to kill each other off (which brilliantly adds macabre humor to the mix). Technically, Shadow of a Doubt is simply amazing. The film features fantastic uses of insert shots and montage to set scenes up and give the viewer. Shots such as the opening sequence, give the viewer a plethora of visual information without pandering. Other technical marvels include the Camera seemingly “going through” a door (these are pre-CGI days kids). The Cinematography was wonderful, however, it seems that Universal did not go through a through restoration process as scratches, damaged frames, etc call still be seen (2006 DVD single disk release. I believe that it is the same disk included in Universal’s Box set of Hitchcock, and likely the same disk repacked from its first DVD release.) I would to see the film get the full restoration effort to truly present the film in a way it deserves. A wonderful film, full of humor, macabre and even some genuinely touching moments (most come from the Newton matriarch Emma [Patricia Collinge]), I cannot recommend this film enough.